You are here: Home / Blog entry / Sweet Streets hits Tokyo! In a spooky doubling-back-on-itself kind of move, Sweet Streets, which is an LA art movement inspired by Tokyo Street fashion, will be exhibiting in Tokyo! Caro of blog Hi Hi Caro! curated 2 exhibtions at Gallery Nucleus, where the art was inspired by Japanese, and especially Harajuku, street fashion. Sweet Streets 2 ran from September 11, 2010 – October 4, 2010 and included a fashion event called the Harajuku Kawaii Experience, in association with 6%dokidoki. Here fans got a chance to meet and discuss Japanese kawaii fashion with 6%DOKIDOKI founder Sebastian Masuda and shopgirls Yuka and Vani! Earlier this week, i received a humbling offer to curate a select exhibition of “sweet streets” artwork at lovlies laboratory, aka lov-lab. Lov-lab is located in the heart of Harajuku, japan above the 6%dokidoki shop. 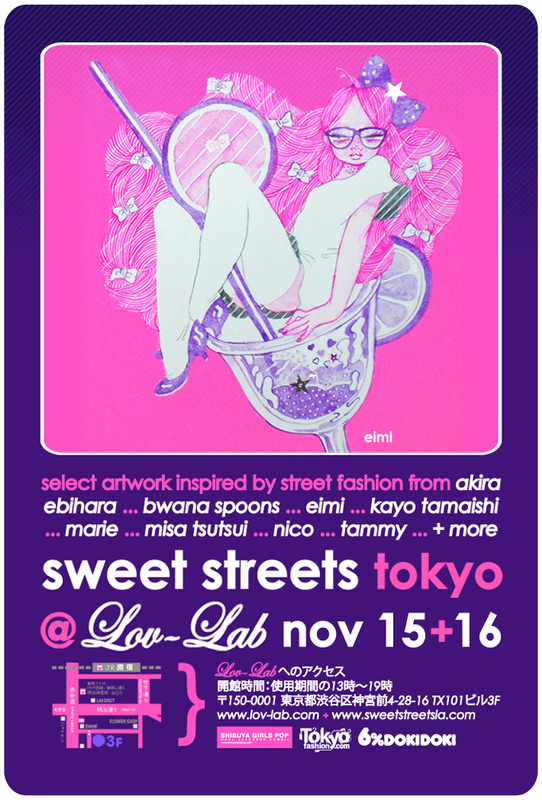 “Sweet streets tokyo” will feature several artists- akira ebihara, bwana spoons, eimi, kayo tamaishi, marie, misa tsutsui, nico, and tammy- in a short and sweet version of the los angeles show. Many have already inquired about the possibility of another tokyo exhibiton. Yes, we are also discussing a larger exhibit for the near future. For now, please stop by and enjoy the art if you are in tokyo on november 15th & 16th. I am honored by this amazing opportunity presented to me by 6%dokidoki! thank you! So, if you’re in Tokyo next week you can see it for yourself! For others like me, we’ll just have to wait til the BIG exhibition is announced, and hope we can get to Tokyo in time to see that one.